Seven years ago I posted about what I beleive is a phantom issue from Tuighaunock Lodge #409 described in the Blue Book as the S16. …The 409S16 is also a need of mine. I have not seen one. It was added to the BB by Bob Connor before I took over from him. I suspect it may be a duplicate of the S14, S14.5 or another S10 design variant. 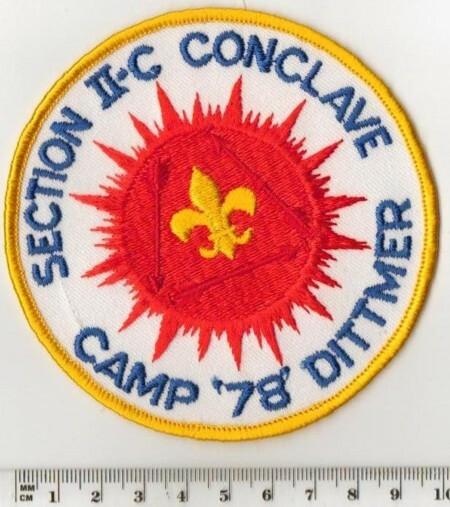 I wrote about the 1978 NE-2C Section Conclave back in December 2008. The Conclave was hosted by Tuighaunock Lodge #409 and held at their Camp Dittmer. While I believe I have the neckerchief in duplicate, the pocket patch is still a need of mine. Anyone have one for trade or sale? 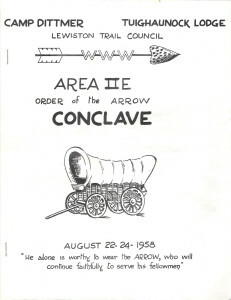 Christopher Carlson sends along a scan of the pamphlet cover from the 1958 Area 2-E Conclave which provides the date and theme for the weekend. 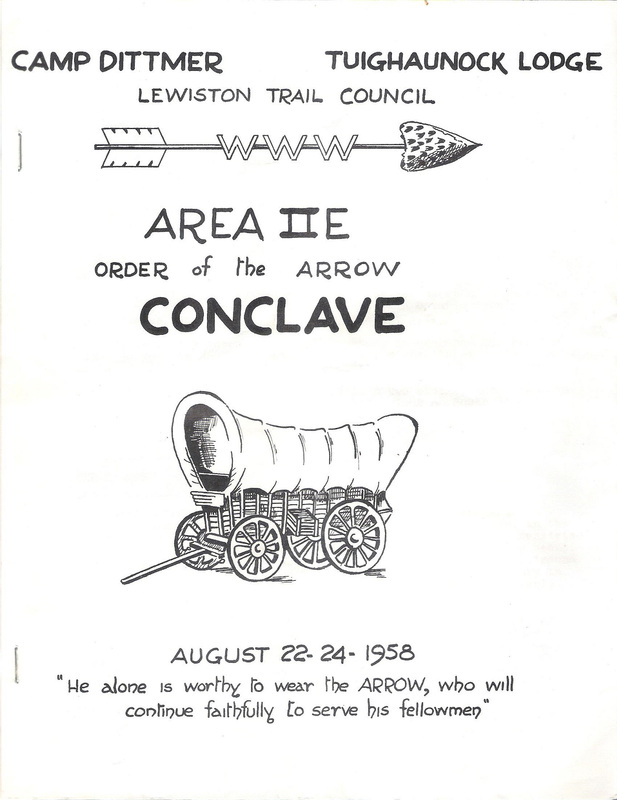 The conclave was held over the weekend of August 22-24, 1958 and the theme was “He alone is worthy to wear the Arrow who will continue to faithfully serve his fellowman. 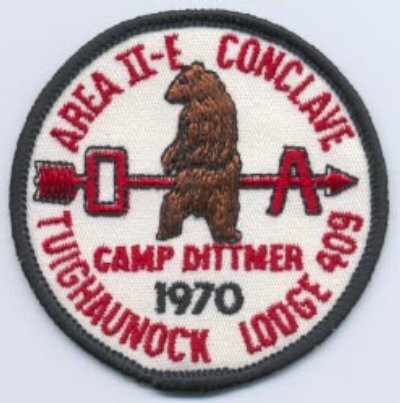 The 1970 Area 2-E Conclave was held at Camp Dittmer and hosted by Tuighaunock Lodge #409. 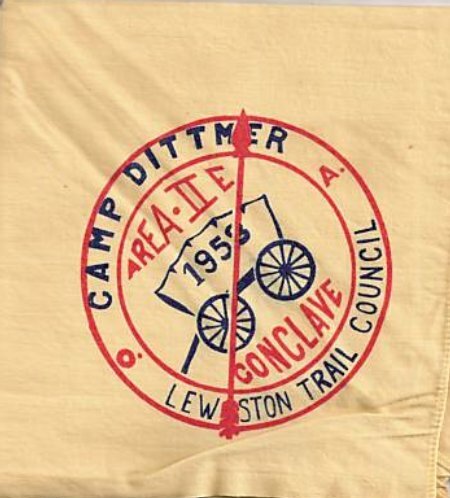 The 1958 Area 2-E Conclave was hosted by Tuighaunock Lodge #409 and held at their Camp Dittmer. As far as I know, there was only a single item issued for this conclave, the neckerchief pictured below. The cloth is a light yellow. Update July 2013 Christopher Carlson sends along a scan of the pamphlet cover from the conclave which provides the date and theme for the weekend. 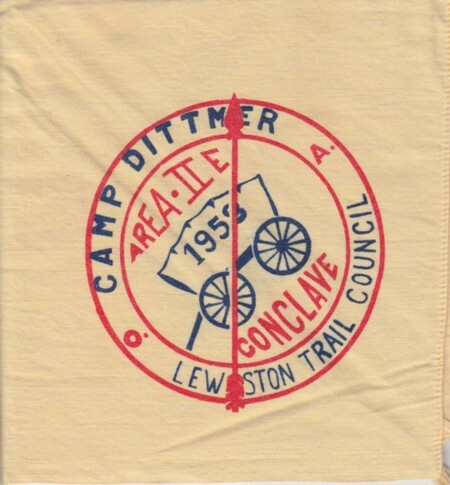 The 1958 Area 2-E Conclave was hosted by Tuighaunock Lodge #409 and held at their Camp Dittmer. To the best of my knowledge, there was only a single item issued for this event, a silk-screened neckerchief. Still a need for me, anyone have one for sale or trade?